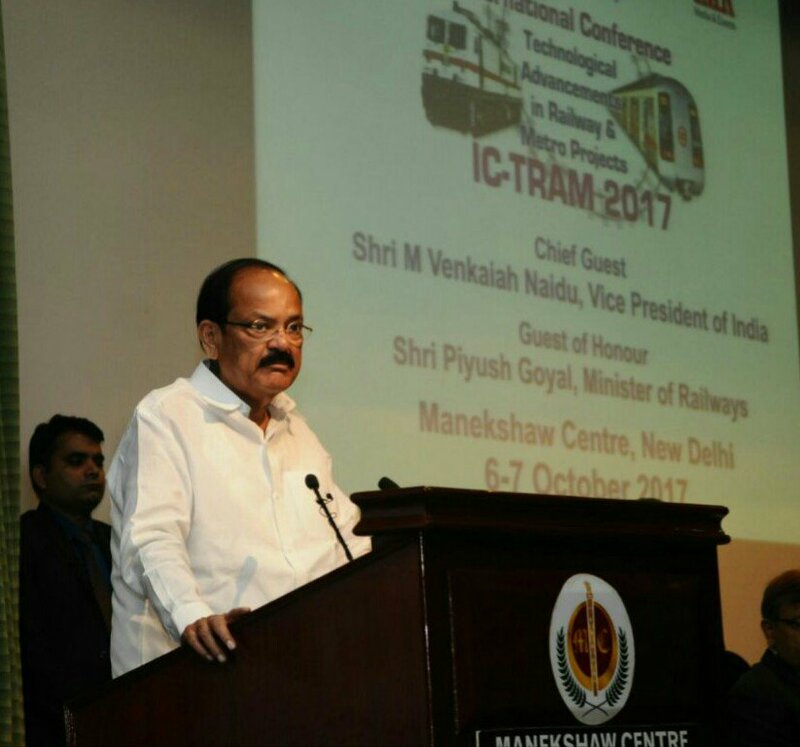 Hon’ble Vice President of India, Shri Shri M. Venkaiah Naidu inaugurated an International Conference on Technological Advancements in Railway and Metro Projects (IC-TRAM 2017) and an Exhibition on October 6 – 7, 2017 at New Delhi. 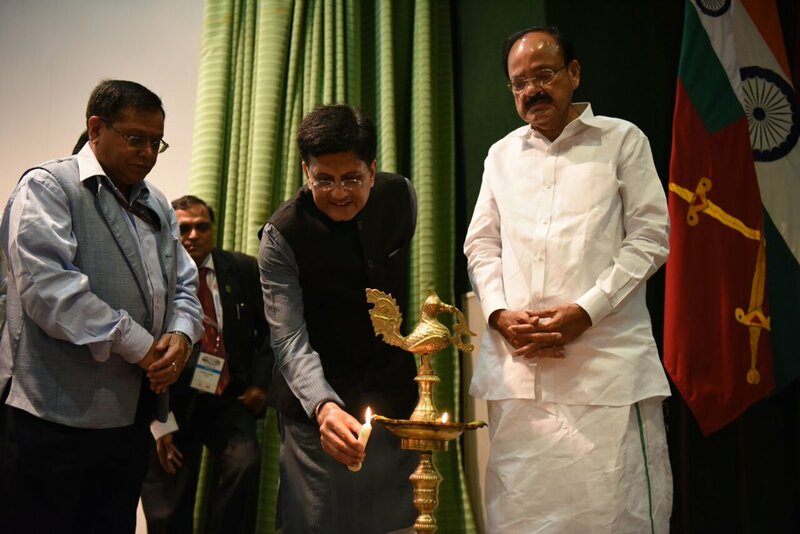 The conference Minister of Railways & Coal, Shri Piyush Goyal also addressed the conference. The Conference has been organized by the Defence Infrastructure Planning & Management Council(DIPM), the Ministry of Railways, the Ministry of Urban Development and the Niti Aayog. The Chairman, Railway Board, Shri Ashwani Lohani, Member, Niti Aayog and Chief Patron of DIPM Society, Dr. V. K. Saraswat, and other dignitaries were present on the occasion. Addressing the conference, the Vice President of India, Shri M. Venkaiah Naidu has said that the Technology along with managerial excellence can chart a new trajectory. 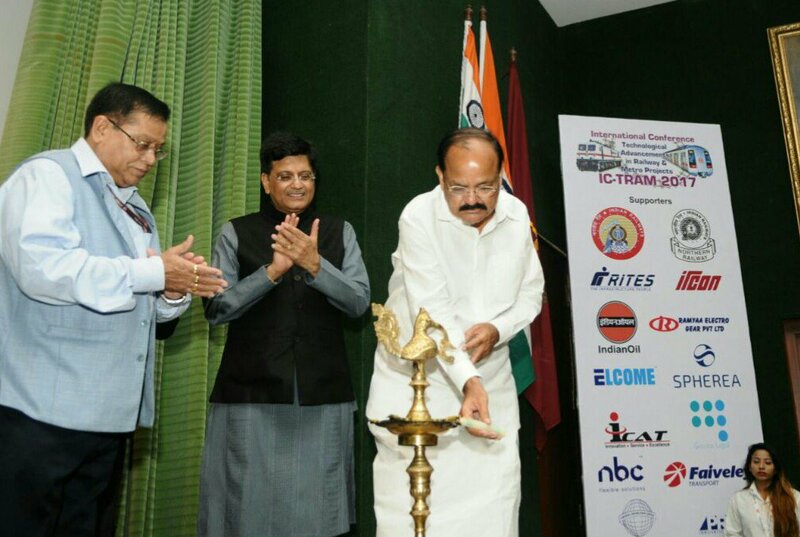 The Vice President said that with urbanization taking place at a rapid pace in India, the need for efficient and cost-effective transport is critical in ensuring faster mobility and sustainable development. He further said that new concepts such as ‘Transit Oriented Development’ should be tried out and promoted which will improve the lives of people living around the metro stations in a big way. The Vice President said that the Indian Railways need to plan for a massive expansion very meticulously with forward looking, efficient technologies and innovative practices currently available across the globe and adopt them to serve our country’s aspiring population. He further said that the IT revolution sweeping the world, to which India has also been a major contributor, is bound to improve the efficiencies in signaling, communications and safety and help in areas like intelligent transportation systems. The Vice President said that in the Indian ethos, we believe that science and technology are tools to improve the quality of life and we say “Bahujana hitaya, bahujana sukhaya” implying that we aim at the good of humanity at large and also care for the happiness of the entire population on this planet. We also believe this is possible if we are open to new ideas and concepts, either home grown or from outside, he added. The Vice President expressed his hope that the discussions and the deliberations in this two-day conference will provide a fast-track approach to build many state of the art railway systems that will improve the economy and the quality of life of people in India and the rest of the world. “I am extremely happy to address this august gathering at the inaugural session of the International Conference on Technological Advancements in Railways and Metros. From its origin purely as a colonial project in 1853, the Indian railways has emerged today as one of the largest rail networks in the world and an important economic engine in the growth and development narrative of India. It is estimated that in the next five years the Indian Railways will be the third largest railway system in the world accounting for 10 per cent of the global market. With its extensive network, Indian Railways caters to lower, middle and upper middle classes for both, short and long distance travelling. It also one of the largest employers in the government and generates informal employment through forward and backward linkages. Rail historian and journalist, Christian Wolmer, in an article succinctly summed up the transformative role played by the railways. He said: “Nowhere other than India is the railway so indelibly connected with the image of the nation. Just as there is no single country on earth that has such a broad cultural, ethnic, and racial mix as India, there is also no railway system that has played and, crucially, continues to play such a fundamental role”. The Indian Railways connects the vast country through its extensive network of 64,000 km of track covering about 8,000 railway stations and 100,000 bridges as well as signalling and telecom network. It provides transport services to about two crore or 20 million passengers every day. Each day, 20,000 trains criss-cross the length and breadth of India serving, in a year, a population of about 700 crore ( seven billion) people and transporting more than 1,000 MT (billion tons). With the number of passengers projected to touch thirty million in the next few years and the demand for transportation of goods also touching four million tons of freight daily in the near future, the railways are poised for a massive expansion. I am told that investments to the tune of Rs. 8 lakh crore are planned in the next five years on various projects in the railways. With urbanisation taking place at a rapid pace in India, the need for efficient and cost-effective transport is critical in ensuring faster mobility and sustainable development. As part of meeting the growing transport demand in cities, several new metro rail projects are in different stages of execution, apart from those in operation at Kolkata, Delhi, Chennai, Bangalore, Kochi, Lucknow and Mumbai. Metros are under construction at Ahmedabad, Hyderabad, Nagpur, Noida, Navi Mumbai and Pune, among others. Several others are under consideration and planning. Once various metros become operational, the intra-city mobility will improve by leaps and bounds. I also understand that new concepts such as ‘Transit Oriented Development’ being tried out will improve the lives of people living around the metro stations in a big way. So, friends, the Indian Railways will have to plan for this massive expansion very meticulously. It will have to look for technologies and innovative practices currently available across the globe. It will have to be forward looking, efficient and adopt the state of the art technologies that serve our country’s inspirational population. Against this backdrop, this conference is very timely. I am glad that this international conference is focusing on a host of technologies that are going to play a key role not only in improving the services but also in the safety of the commuters. The IT revolution sweeping the world, to which India has also been a major contributor, is bound to improve the efficiencies in signalling, communications and safety and help in areas like intelligent transportation systems. I am glad that we have amidst us the Inventor of Maglev, also called magnetic levitation train. Maglev trains are very fast trains. Maglev trains float over a guide way using the basic principle of magnetic repulsion. This technology is apparently even ahead of High Speed Railways. Recently, we have embarked on collaboration with Japan to introduce high speed, ‘bullet trains’. I am glad that technology is being harnessed for the welfare of the common man. In the Indian ethos, we believe that science and technology are tools to improve the quality of life and we say “Bahujana hitaya, bahujana sukhaya” implying that we aim at the good of humanity at large and also care for the happiness of the entire population on this planet. We also believe this is possible if we are open to new ideas and concepts, either home grown or from outside. The ancient visionaries in India had given expression to this receptive approach when they said: “Aano Bhadrah Kratavo Yantu Vishwathah” (Let noble thoughts come to us from all sides). We should continue to build on this commonwealth of knowledge and wisdom. Technology will also be a potential ally for improving the safety and security and enhance the quality of passenger experience. I hope this Conference will provide some new insights in this regard drawn from the global best practices. The managers of our railway system must use every opportunity to update their knowledge and skills. Even the best systems in the world have to constantly keep learning and doing things differently to serve the populations better. With about eight lakh crore planned investments, opening up of FDI in rail infrastructure and implementation of GST, I am sure the Indian railways will stand to benefit particularly in the long-distance transportation in the years ahead. Technology along with managerial excellence can chart a new trajectory. I take this occasion to welcome all the experts gathered here today, congratulate the organizers and wish the conference a grand success. I do hope that the discussions and the deliberations in this two-day conference will provide a fast-track approach to build many state of the art railway systems that will improve the economy and the quality of life of people in India and the rest of the world. “May our intentions and aspirations be alike, so that a common objective unifies us all ”. 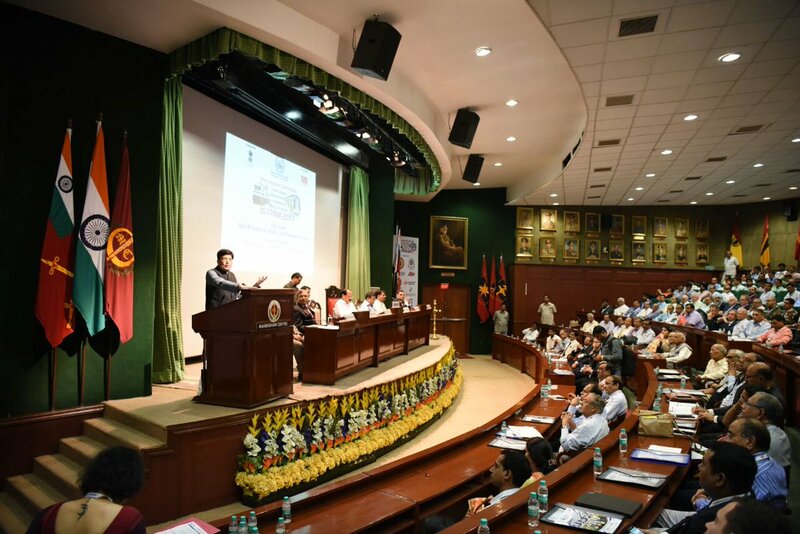 Speaking on the occasion, Minister of Railways & Coal, Shri Piyush Goyal said, “The need for transportation in urban areas has increased many fold and Metro Railway has a big role in meeting transportation needs. Referring to the significance of innovation and research. He said that R&D is the driver for growth and it forms the eco-system, which encourages scientists to persevere for better yields. He said that we have to go beyond the boundaries of conventional thinking to achieve excellence. He said that India has already taken greater strides in the fields of climate change, renewable energy and activities like rolling out of LED programs. He said that time has come to lead the world and also called upon to make India as the nerve centre of innovations and technological advancements. He emphasized that fund should never be constraint for undertaking innovation and technological advancements. Referring to the contribution of Vice-President in public life, who was the Chief-Guest of the program, Shri Piyush Goyal said that Shri Venkaiah Naidu ji has been relentlessly working for the last 40 years for the welfare of the people, especially for farmers and common-man. Chairman, Railway Board, Shri Ashwani Lohani said that with mobility requirements increasing several fold due to massive urbanization, the need for building Metros in our congested cities and strengthening the Railway infrastructure, has become imperative and assumed critical proportions. He said that the conference will bring up new technological ideas and innovations in the fore and help Indian Railways embrace some of those ideas for moving forward in the present era. Member, Niti Aayog and Chief Patron of DIPM Society, Dr. V. K. Saraswat, said that this conference is having the best speakers who are not only experts in their chosen subject but also have a deep understanding of railway and metro technologies, implementation and solutions to problems from personal experience. 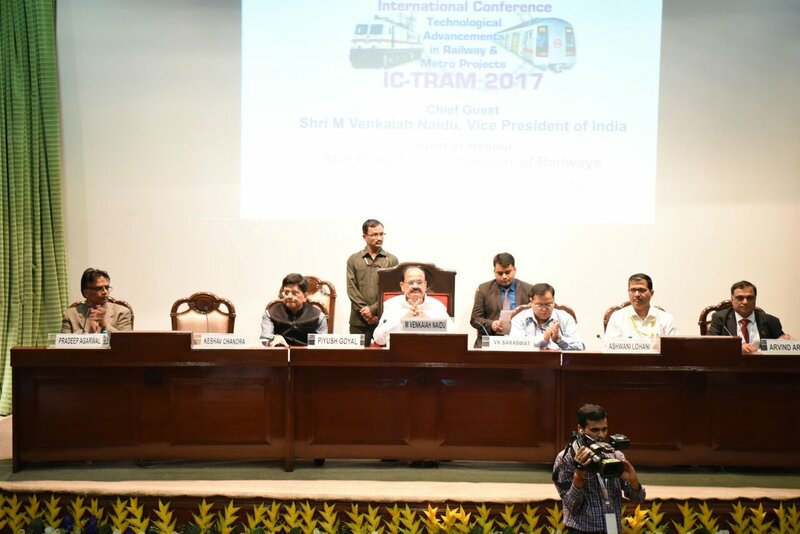 Chairman, Organizing Committee of the Conference (IC-TRAM 2017) and former Member, Railway Board Shri Keshav Chandra outlined the objectives of the conference. He elaborated the focus areas being dealt in different session of the conference. He pointed out that this conference is a fine opportunity for all those in the business of railways and metro transportation, as well as the larger transportation community, operators, engineers, architects, planners, administrators, scholars and so on to upgrade their technical skills and knowledge, interact with specialists from various engineering disciplines, hear from the experts in India and abroad on the fine ‘art and science’ of metro building and railway modernization. Experts will share secrets of effecting efficiencies through enhanced equipment reliability, World-renowned Safety Experts will expound on the essential fundamentals of accident free performance. High speed railways-the international experience-the variants. Semi-high speed railways & their relevance. Next generation railway coaches, using latest lightweight materials. New propulsion systems such as turbine, fuel cell etc. Use of renewable sources of energy, such as, bio-diesel, methanol, etc. Railway’s drive for self-sufficiency in generation of energy for traction purposes. Cutting edge technologies in signalling& telecom. Advancements in electric-a) overhead equipment/3rd rail, b) traction /general power supply with emphasis on green energy c) heating/air-conditioning. Train management & protection systems, creating a foolproof operational safety net in all-weather conditions, including dense fog. Advancements in civil engineering a) track b) bridges & c) tunneling. Development of world class railway stations. Emerging technologies in manufacturing of rolling stock. Advancements in civil engineering a) track b) bridges & tunneling c) station buildings & ancillaries (psds, etc). Cutting edge technologies in signalling & telecom, driverless train operations. Electrical-a) overhead equipment/3rd rail, b) traction /general power supply with emphasis on green energy c) heating/air-conditioning. New trends in accident prevention, safety & security-zero tolerance for accidents. With the demand and volume for rail transport increasing manifold, there is a need for an efficient and state-of-the-art transportation system to meet the growing commuting requirements of the people in the urban areas and other parts of country. The Railways need to achieve their full growth potential with faster, reliable and more punctual services. With mobility requirements increasing several fold due to massive urbanization, the need for building Metros in our congested cities and strengthening the Railway infrastructure has become imperative and assumed critical proportions. India is on the cusp of making a quantum leap into marking its infrastructure to be counted among the best in the world. The Railways and the Metro network are the lifeline of the nation connecting people and places. Both require huge investments, knowledge of advanced technologies and skill sets to execute projects without delays. A deficit in these parameters had held us back for long. Our present leadership is determined and decisive and we need to look ahead with confidence and with purpose. The conference will bring up new technological ideas and innovations to the fore and help Indian Railways embrace some of those ideas for moving forward in the present era. In the past two decades Indian Railways has grown manifold not just in terms of size and volume, but also in terms of usage of cutting-edge technologies. Today, Indian Railways, is entering new fields, such as High Speed Railways, Dedicated Freight Corridors, bridging new frontiers by laying tracks in inhospitable terrains of the North-East, building mountain railways and using alternative fuels to reduce dependence on fossil fuels to name a few initiatives. In more or less the same period, (since Delhi Metro became operational in 2002), concurrently, there has been an awakening of sorts pan-India, in the direction of building more and more Metros to cater to the increased mobility requirements of the burgeoning population of the metropolitan towns. As of now some 35-40 metros are under planning or execution, aggregating a colossal investment of some $68 bn (Rs 4. 5 lakh crores) over the next five to seven years. This will soon make India one of the top Metro hubs in the world, ahead of some of the most advanced countries in the world. The conference deliberations should be taken forward in consultation with the clear intent of finding lasting solutions. In all, 40 speakers are scheduled to address the delegates over two days. The Defence Infrastructure Planning & Management Council of India is a technical body under the DIPM Society which is registered under the Society Registration Acts, 1860. The council is non for profit institution working in the field of Infrastructure technology innovations, development, Project Management, Contract Management, project delivery, skilling India in the field of Infrastructure in general and Defence Infrastructure in particular in the Government Sector. 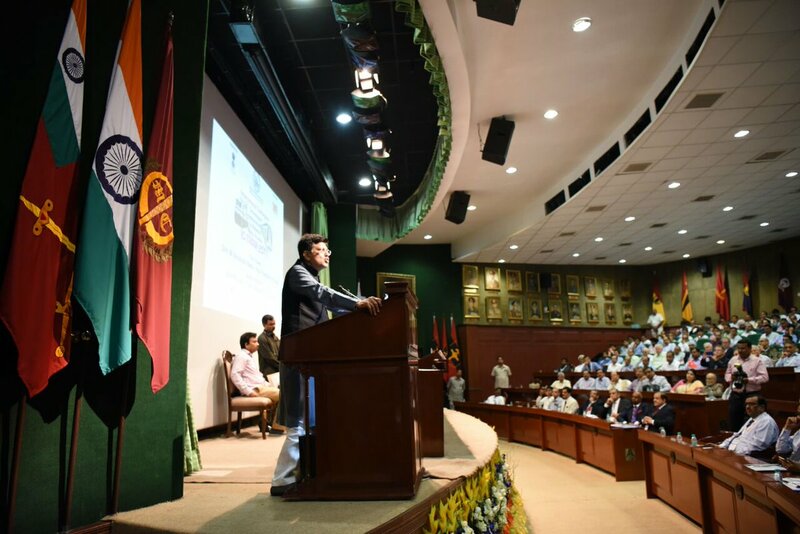 The key objective of DIPM Council of India is to bring all stake holders at one platform in advisory role to the Govt of India especially Ministry of defence on all aspects of Defence infrastructure , except strategic needs of the country, with the aim of sustainability, innovations , economy and efficient Project delivery. DIPM council of India shall bring together all stakeholders, technologists, Govt officers on one platform to ensure economy, efficient Project delivery and use of most advanced technology in the field of Infrastructure in the country. DIPM Council of India aims to become a key stakeholder in the country in all aspects of Infrastructure development through group of specialists on voluntary basis, become a partner in Make In India and be an voluntary advisory body to Government of India. Dr. V. K. Saraswat, Member, NitiAayog is the Chief Patron of the Society. The Conference was held under the aegis of Ministry of Railways and Ministry of Urban Development. The Conference dealt with cutting-edge technologies, innovation and safety in Railways and Metros. The thrust was to maximize the ‘Make in India’ initiative and make India self-sufficient.